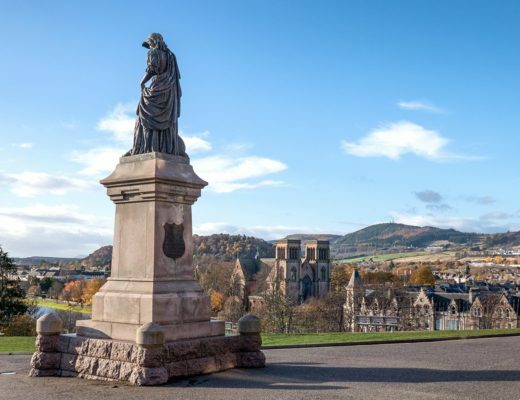 Train travel is one of the best ways to see Europe – the continent’s fairly compact so it’s easy to get around, and you can sit back and soak up the stunning views with a picnic. But if you’re planning a rail trip, most of the suggested itineraries seem to be geared up for Interrailers on month-long trips. It doesn’t have to be this way though – you can have a mini European rail adventure too. Pick a region and a few destinations and get route planning (the Seat 61 and Deutsche Bahn websites are great for routes and timetables). Or if that sounds too much work, here are five of Europe’s best one-week rail trip ideas to get you started. Each route is possible in a week, but if you’ve got more time then you can take it slower and spend more time in each place. The idea isn’t to wear yourself out trying to see everything in every destination, but to take in the highlights and get a taste for each place (and if you find somewhere you love, you can always come back for longer). Begin your trip with a couple of days in Venice – cruise the Grand Canal, get lost in the backstreets and brave the crowds at St Mark’s Square and the Doges Palace. Then take an early train on to Florence (2 hours) and spend the afternoon gallery-hopping. Finish getting your fill of Renaissance art the next morning before taking the short journey on to Rome (1.5 hours) for the afternoon. Spend the next day seeing the historical sights of Rome before travelling south to the gritty coastal city of Naples (1 hour 10 mins). Start your trip in the Spanish coastal city of Barcelona and spend a couple of days checking out Gaudi’s handiwork and catching some rays on the beach. Then take an early train down the coast to Valencia (3 hours) where you have the afternoon and next morning to explore the city’s mix of ancient and modern architecture, and try a paella in the city where it was first created. 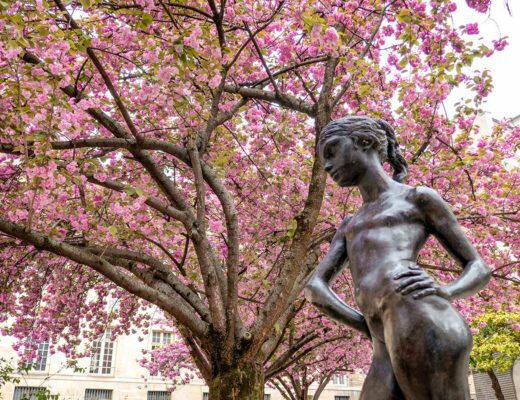 Take a short train ride inland to Spain’s capital Madrid in the afternoon (1.5 hours) and spend the next day visiting its parks and galleries. So which would be your favourite route? 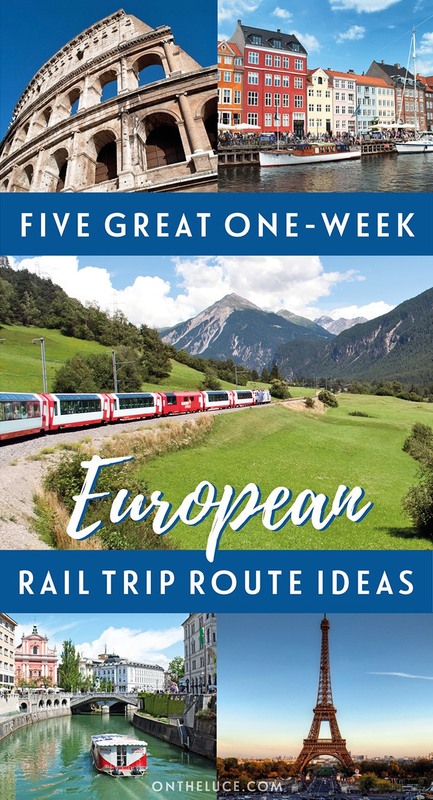 Get lots more inspiration for travel by train in Europe in the On the Luce ‘European Rail Travel Ideas Book’, launching 2019. Glad to hear I’m converting you to the joys of rail travel! The Swiss trains on the first route were fantastic, but I’d really love to do the whole train on the ferry trip over to Sicily, definitely a unique experience. I’m just starting to plan our trip to Italy this summer. I know we’ll be traveling by train, but there are so many more side trips to figure out. It’s daunting! 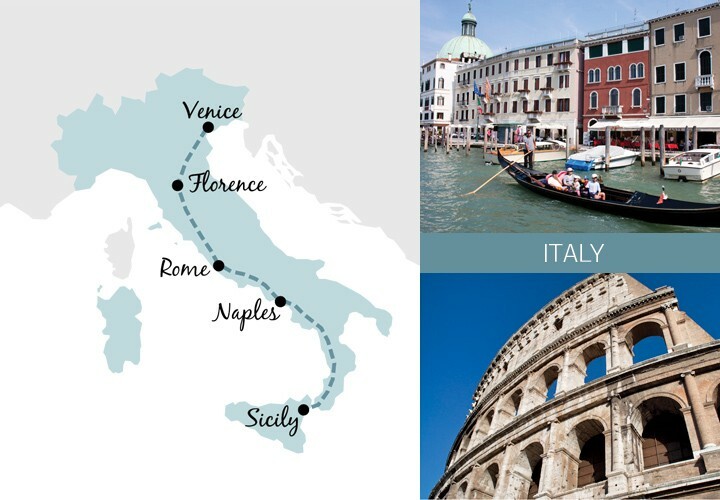 There’s so much to see in Italy it’s hard to narrow it down! I loved the area around Naples and Sorrento (also very easy to get around on the trains) but think Sicily will be my next Italian rail trip. That was one of my favourite trips last year! It’s actually pretty easy to do as a long weekend trip from Northern Europe and flights were pretty reasonable too. I’m heading to Norway this summer and I’m definitely looking forward to the scenic train rides! The landscapes out there are just amazing – I didn’t drag myself away from the train window the whole time! Great itineraries, Lucy. They all sound fantastic, but I am partial to the Scanadanvian trip. I have never been to any of those cities and feel like there is so much to explore! I would love to see more of Scandinavia too – Norway was amazing last year so I’ve got the taste for it now! I’m possibly doing a cruise around that area this year but if not I’ll be planning a train trip soon. Thank you! Yes Italy is a great choice, so much to see in just one country, love the mix of beaches, history ad culture (not to mention the food). Looks great – had in mind a version of the Spain and Portugal trip next year but maybe extending it by starting in Paris and then taking the high-speed train down to Barcelona. Scandinavia is very tempting as well. Really enjoy posts like these! Sounds like a great trip planned – I haven’t been back to Spain for years so am well overdue another visit. Love the planning too, it was hard to narrow it down to just five routes (there might be a part 2 sometime!). Oooh this post definitely inspired me to start planning a Europe train trip! The northern and eastern Europe itineraries especially appeal to me. This is awesome, thanks! Thanks Kelly, there are so many great routes the hardest bit is narrowing down where to go! These are great Lucy! I did a train trip from Hamburg, Germany > Copenhagen, Denmark > Stockholm, Sweden >ferry> Turku, Finland > Tampere, Finland > Helsinki, Finland >ferry> Germany! It was amazing, the trains are so great and cosy in the winter! I didn’t have time to get to Norway but will be road tripping it this summer! Thanks Rachel. Thanks sounds like an epic Scandinavia trip! I have definitely got to get back out there and see more of the region. You will love Norway too I’m sure (might have to leave the camper for the day and do the Flamsbana though!). Thanks Suze, hope it comes in useful. There’s so much to see in Italy, I have been a few times but still have a lot of places to visit (Lake Garda is one). Wonderful suggestions and a beautifully-designed post! I especially love your map graphics. How did you make them? Thanks so much, I do love a good map (its my geography student background!). I created them using Illustrator – I have a map of the world where each country is a separate shape, then highlight the ones I want and draw on the route and labels (I like Illustrator as it’s vector based so you can zoom right into one country without it going blurry). Thanks for the tip. We love maps, too. Well done! Great article, very inspirational. I love your maps where did you get those? Thanks, I drew the maps using Adobe Illustrator (part of my day job is in graphic design so it comes in useful for the blog sometimes too!). I really can’t decide which of these I’d like to do most! I love travelling by train – it’s just a shame that it’s such a luxury here in Germany, but the prices are just so high. It’s definitely the most civilised way to travel! You do need to be pretty organised though and book about three months in advance to get the cheap fares though. This article makes me want to hop on a train immediately! I would gladly choose all of them! Thanks – yes the hardest bit about European rail travel is choosing where to go! Very nice article Lucy. I would go on a Germany/Austria itinerary myself. Wurzburg – Munich – Salzburg – Innsbruck – Krimml waterfall. Add on Feldkirch or Bregenz on Lake Constance if time allows. The Alpine scenery is stunning. Belgium and the Netherlands are small enough to use one City as a base and explore from there. The intercity trains are usually at the same time every hour, very reliable too. Thanks Mark, yes I think I will have to do a follow up with some more itineraries as there are so many possibilities! Germany and Austria would be great, I’ve not been to Germany for years so am overdue a bit more exploration. Porto was great – I spent a really sunny February weekend there a couple of years ago and loved it, so Lisbon is high on the list now. Though having said after the fjords I would love to see more of Scandinavia too – decisions, decisions! Wow Lucy, what a great post, especially with the cute maps! I’ve bookmarked this under ‘travel ideas’ and hopefully I’ll get to hop on one of these trains soon. I’m especially intrigued by Italy and Spain/Portugal. I remember taking the train from Bologna to Florence and how pleasantly surprised I was with the Italian trains. They are so comfortable, especially in Business Class. Our seats reclined and we got a free glass of prosecco, too! Such good value for money especially if you book in advance, so an Italian train adventure is definitely high up on my travel to do list 🙂 btw, any ideas for train journeys just within France? Or would you need a car there? Thanks so much, hope it comes in useful. The business class seats with prosecco definitely sound like the way to travel! France would be easy by train too. Paris to Reims (for Champagne tasting), then Strasbourg and through the Swiss Alps to the South of France and along the coast would be a good route. Great itinerary – I love champagne (who doesn’t? ), been to Strasbourg once as a kid and would love to visit again and I guess you can’t go wrong with the Côte d’Azur 🙂 thanks! Ace post, the only way to travel in Europe. Nice use of maps too! Thank you – yes it’s definitely my favourite way to travel! Have actually planned a train ride from Lison to Porto for next month! The Porto lure was entirely due to your posts about the city!! Fantastic, Porto is great, sure you will love it! Woooonderful. You’ve done a fantastic job of breaking the journeys down Lucy especially as professional people sadly, really can’t spend a month travelling all over Europe by train! I can’t decide which ones are better so I’ll choose all of them LOL! I went skiing to the Czech Republic by train this winter and in the summer, we’ll be going to Hungary, the Czech Republic & Slovakia as I quite fancy showing my son where his mummy used to live in Prague so many years ago…! Yes I wish I had a spare month or two to do an epic train trip! Your Hungary, Czech Republic and Slovakia route sounds like a good one – since I wrote this I’ve come up with at least another five more ideas so I think there might have to be a part two at some point! Wow! This is very informative 🙂 Would like to ask for your help though if that’s fine with you. Im travelling to the Scandinivia this June. Here’s some of the countries im interested: Denmark, Copenhagen, Hamburg, Berlin, Amsterdam, Brussels, Paris, Strasbourg, Switzerland, Milan, Venice, Florence, Prague, Bratislava, Budapest, Vienna, Salzburg, Munich. Which country/s do you think should I eliminate from my list? Hahahah I know its a lot to handle. I just need someone to tell me which of these should I eliminate hahaha cause I cant figure it out myself. Start and end point will be Denmark. Copenhagen > Hamburg (4 hours 30) > Amsterdam (5:15) > Paris (3:20) > Strasbourg (2:20) > Zurich (2:25) > Salzburg (5:25) > Vienna (2:30) > Prague (4:10) > Berlin (4:45) > Copenhagen (7:00). You can also add in a day trip from Vienna to Bratislava by boat. Anyway hope that helps! This is the reason why I love traveling by train. You get to see a closer look of the wonderful views of nature. Thanks for sharing your travel by train experience in Europe. Thanks, yes the views from the train windows are fabulous, so much better than just flying over it all! Thanks, the train routes in Scandinavia are well worth a try – very quick and efficient and some stunning scenery along the way! Ps: First time here and I am glad to found your blog. Love the color palette. Thanks so much, lovely to hear you like the post (and the blog!). Thanks so much and great to have you following along! Wonderful post, love travelling around europe by train, the people watching and adventure is superb, and wondering to the bar whilst en route, mustn’t forget that! I did a circle from London>Paris>Avignon>Nice>Monaco>Cinque Terre>Florence>Bern>Brussels and back to London with a few stop offs in between. An unforgettable journey filled with booze, scenery and laughter! Next stop Oslo after reading this! Love the sound of your route, the South of France has some amazing train journeys along the coast. It’s definitely my favourite way to travel (and like you say mustn’t forget the bar!). wonderful picture and very very thanks to submit suggestion. You’re welcome, hope it comes in useful! This is SO fantastic! Pinning this right away to keep for future. My fave is the Spain and Portugal itinerary. That’s great! I am going to have to try and get back to that part of the world soon too, I’ve got so much still to see in Spain especially. There’s always next time! Hope you enjoy Italy, it’s one of those places I can’t seem to stop getting drawn back to again and again. Thanks, yes there are a lot of great options in Italy, you could easily spend a month travelling by train and not leave the country! Also, your graphics are lovely and sophisticated. What program did you use to craft them? Thanks Tricia, yes it’s such a shame that there are not more rail routes in the US, it’s crying out for some scenic train journeys. The maps I created in Adobe Illustrator – I have a base map of the world and then highlight the countries and draw on the route and labels (part of my work is in graphic design so it comes in useful having all the software available!). This is awsome, really! I’d love to visit Scandinavia, I dream it since I was a child! I loved Norway last year and it’s made me want to see more of the region for sure – hopefully Sweden will be next! Thank you! The first route is similar to one I did last summer and there are some amazing views along the line, especially in Switzerland. They are great suggestions, and I plan to do some of them!! Sounds wonderful. Do you see many people traveling by themselves? I am recently widowed and feel I want to do all these trips alone. I’ve seen quite a few solo travellers on my European train trips, the carriages tend to be quite sociable and we’ve ended up chatting to people, especially on the longer journeys. I wouldn’t have any concerns about safety etc doing train travel alone myself. I’ve been eyeing rail trips for a bit now and this is a perfect list! Thanks for sharing, great ideas here. That’s great – hope they come in useful and have a fantastic trip! 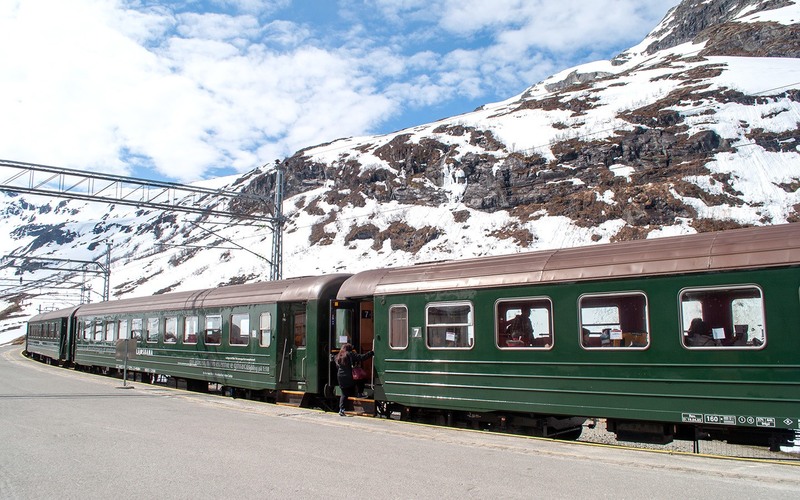 My favorite: St. Moritz to Zermatt with the Panorama train in Switzerland. Did it in autumn and would love to do it in the Winter again. That’s a beautiful route, we did part of it last summer but winter would be great too. A great post, I want to do them all! Thanks, I don’t think I’d ever run out of train route ideas! I haven’t done any train journeys in Europe. I’ve spent many hours in cars and on buses. I’m definitely doing it wrong! You are! The train is definitely my favourite way to travel, seems so much more relaxing than on the roads. Thanks – there is definitely something a bit old fashioned about train travel but I think that’s part of the charm to sit back and soak up the scenery in comfort! I went from Rome to Messina in Sicily and then back up to Venice by train in 2006. It was one of my best experiences I have ever had which I will never forget! Can only recommend! Sounds like a fantastic trip – am hoping to get back to Italy for another train trip next year and see some more! Hello! This was really informative and helpful! I love the maps. Can you give any approximate pricing for the tickets, or perhaps a website where I could look up the prices? Thank you! Hi, I would check out the Seat61.com website for some idea of prices (I’m currently working on an ebook with prices for these are more routes but it’ll be a few months yet!). What train goes form Stockholm to Oslo? Thanks – hope it comes in useful. This is amazing Lucy. I loving all the routes and the way you presented them. This was really informative and helpful !! I loves the map. Thanks so much – I’m working on an ebook version with lots more routes and maps too, so will update the site when it’s done! This post was so helpful for me! I am currently trying to plan a week/week and a half train travel trip in Europe and I think I might use your Eastern Europe trip route as a potential starter idea! So glad to came in useful – I really want to get back to that part of the world and see more of Slovenia and Northern Croatia, think a new rail route may be in order! Hi Christina, thanks so much, glad you like the blog and the maps! Afraid they were all custom drawn using Abode Illustrator (my day job is in publishing/design) – I don’t know if you’ve heard of the website Canva though as you can do lots of designs there, and could import a map and add your own captions and routes there. We are just back from an Interrail through Scandinavia and we suggest you not to stop in Oslo but go up to the north visiting Roros, Trondheim and then Bodo. Then one day break on a road trip to Narvik with stunning views between the fjords and again on the train to the swedish lapland… just magic! That sounds like an amazing trip, would love to explore Northern Norway someday! Hi Lucy.. very interesting information you have here. 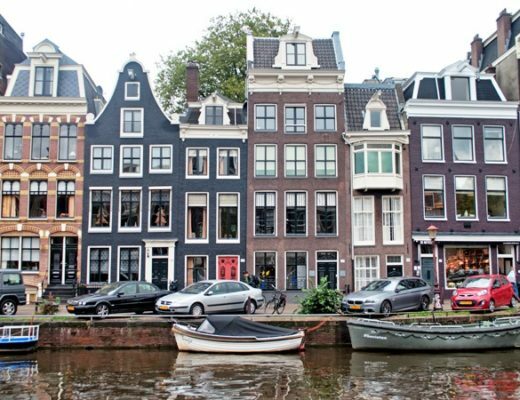 I am interested about Northern Europe – Canal and chocolate.. chocolate is my “thing”.. just wonder, can i do it backwards, from milan, chur, paris, bruges then last in amstedam? Hi Dini, yes that should work just as well – the only bit which is a at all fiddly is the connection between Milan and the scenic train to Switzerland but the Seat61 website has a good description of times and how to book (www.seat61.com/BerninaExpress.htm). Hi Lucy. I’ve travelled by train and car in Europe. I agree that train travel is much more relaxing for the driver but sometimes the scenery is much better on the roads. 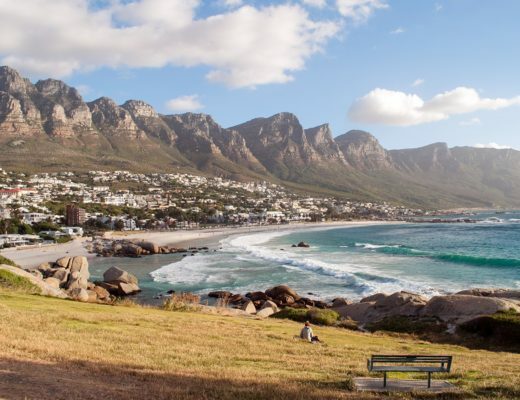 How’s the scenery on your itineraries? 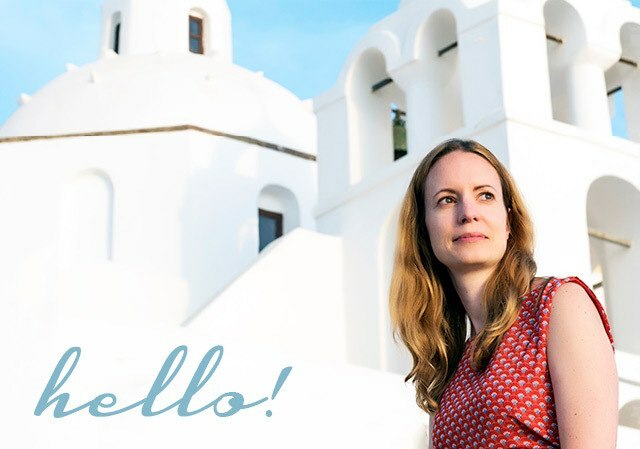 Hi Jeannie, there are some amazingly scenic stretches of train route in Europe – some like the Flam Railway in Norway and the Glacier Express in Switzerland are renowned around the world, but I like the lesser-known stretches too, especially through the mountains and along the coast. The bonus is that everyone gets to enjoy them too if no one has to drive! Thanks – and have a fantastic trip! You just convinced me that Europe is the place to go – me and my boyfriend were discussing our annual trip and he mentioned Europe and I was worried about not being able to see enough in such a short amount of time. But your Spain and Italy itineraries have sold me! Now just to pick which one. So glad to hear its been useful – picking the best route is definitely the toughest bit! Europe is the best destination to visit by train. I have visited Europe with my family. I love travelling by train! I went interrailing when I finished my A-levels and over two weeks travelled Paris-Rome-Venice-Vienna-Salzburg-Berlin. It was great, but may have to check out some of your one week routes! Train travel is so good! That sounds like a lovely route and hope you enjoy trying these out. Thanks Lucy. Very valuable info. How much can a trip like this cost ? Eg armstedam or Italy week trip? Also thinking if Starting in Austria / Slovakia . Are these weekly trips flexible or cast in stone? Can you choose how long to stay in a particular city? Hi, the trips are totally flexible so you can add in extra days wherever you like if you have time to spare. Cost wise there are Interail passes you can get or it is often just as cheap if not cheaper if you can book your train tickets in advance. I’m working on costings for the ebook version at the moment but am finding most can be done for under €200. Hi lucy, really helpful ideas. I am actually thinking to start in praque and follow thru your suggestion vienna, ljubljana, zagreb and than stay a week to explore croatia as I am a big fan of game of throne.. And I am planning to fly home from venice because I thought it would provide more alternative for budget airlines. Do you think the routes already the most efficient to do? Hey Lucy, these itineraries are fantastic! I’m yet to do an interail trip but these routes sound really fun. Are all of the views quite scenic or does it depend on where you’re going? Italy and Scandinavia are top picks for me but I’d love to do them all. Thanks for sharing, they’re really helpful. Thanks! 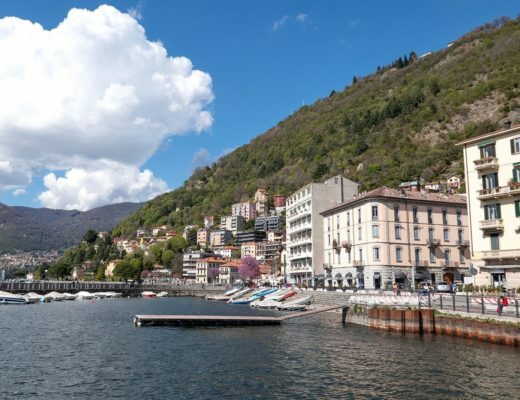 There should be some good views on all the routes once you get away from the cities, but a couple are extra special – the Bernina Express and the Flam Railway are definitely some of the most scenic trains in the world and well worth doing. What do you think of Rotterdam/Bruges/Paris day 1 – then Paris to Chur day 2 – then Chur to Venice day 3 – then Venice to Salzburg day 4 – then Salzburg to Amsterdam day 5? Hi, glad you like the post! Your plan would be possible but there’s a lot of long trips there (a few 7 hours and the last one is 10 hours) so it depends if you’re happy to spend most of the time travelling or want to be able to explore the cities along the way too? If you don’t mind flying then you could stretch it out over longer days then end up with a flight back from Salzburg to Amsterdam. 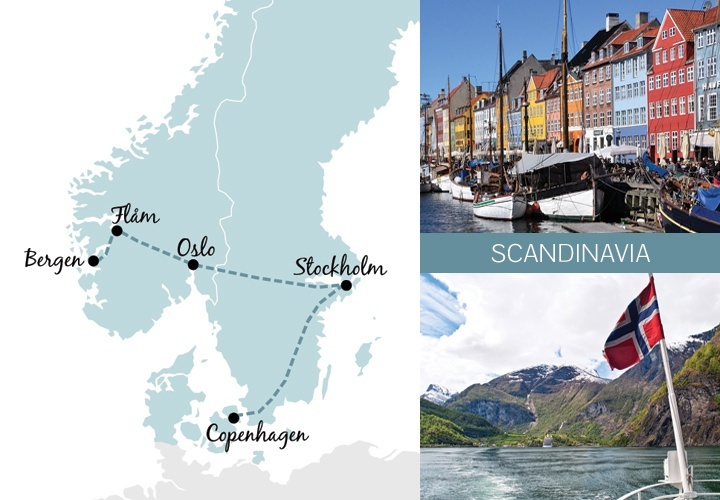 Hi lucy nice reading your blog lots of valuable info 🙂 just wanted to ask more details on your “SCANDINAVIA – FJORDS AND FUNICULARS trip” how long did it take for you to do that trip? and can you share me more details on the transportation/logistics of the trip many thanks! Saturday – Arrive in Copenhagen; Sunday – Day in Copenhagen; Monday – Train from Copenhagen to Stockholm (5 hours 15 mins), afternoon in Stockholm; Tuesday – Morning in Stockholm, then train to Oslo (4.5 hours); Wednesday – Day in Oslo; Thursday – scenic train Oslo to Flam (5.5 hours); Friday – Train Flam to Bergen (3 hours), afternoon in Bergen; Saturday – Fly out of Bergen. Hi Arnold, with a one-day trip it’s always going to be just a taster of the destinations – if you have an extra day to play with I’d definitely add it in there. Otherwise if you get an early train from Copenhagen you can be in Stockholm by lunchtime and then leave in the afternoon the next day. Thanks for your quick response luce 🙂 il be asking you tips if need be in the future 🙂 happy travels! So glad I found this! Currently planning a trip this year and not sure where to start. That’s great – hope it comes in useful! That’s great – sounds like an amazing trip and so glad you enjoyed it! I have a trip coming up for 1 week in the beginning of June. I want to see 3-4 European cities if possible and travel by train. I am starting from the UK. I was thinking to travel to Paris and then go from there. Which cities do you recommend to see from there? Is it better to go towards Switzerland or to go up towards Amsterdam..
Or would you recommend to fly into Copenhagen and do the route from there as I have always wanted to see Stockholm and Sweden. (but not sure if I will see much given the short trip)..
Hi Paul, from Paris you have lots of options! 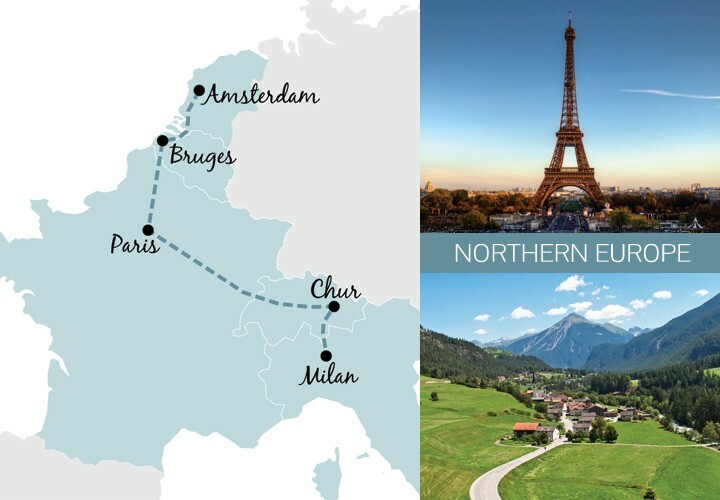 A couple of suggestions (which don’t involve huge long journeys) would be 1) A northern loop to Bruges, Amsterdam, Cologne and Strasbourg then back to Paris, or 2) a Swiss route to Lausanne, then over to Chur for the Bernina Express which has amazing views and runs to Milan, then back to Paris via Geneva. Otherwise you can definitely see a couple of Scandinavian destinations in a short time – Copenhagen to Stockholm is only 5 hours then on to Oslo is 6.5 hours, plus you can do a day trip from there to the fjords called Norway in a Nutshell. So you can have a couple of days in three different cities which is a good start! Hope that helps a bit and have a great trip. Great post! We just spent the whole last summer in Europe and it was amazing. Our Europe train travel took us to 10 countries including travel to and within Hungary, Austria, Germany, Poland, Denmark, Sweden, Finland, Luxembourg, Belgium and the Netherlands. That sounds like an amazing trip! I’m heading back to France and Italy by rail this summer but a Scandinavian trip is definitely next on the list. Hi, Scandinavia would be a good choice for a snowy winter trip. You could arrive into Stockholm and head to Oslo, Trondheim and up to Bodo in Norway. I tell myself I’m going to do this one of these days. Just bookmarked this post. Thanks Lucy! That’s fab – hope you get to do it sometime soon! You’re very welcome – great to hear that it was useful! Hi Lucy, I am leaving in a week from Canada and taking my sons, 12 and 16, eurailing for a couple of weeks starting in Stockholm and then to Copenhagen. I know we will go to Paris a week later but I have no idea what to do in Germany….Do you have any ideas or should i go to a smaller French town East of Paris? Hi Claire, travelling from Copenhagen to Paris there are a few nice German cities which you pass through which might be worth a stop – Hamburg is a big historic port city, or Cologne/Koln with its cathedral and pretty centre. Depending on the route you can also stop in Luxembourg if you fancy visiting a new country, and I love Strasbourg (though it’s only a few hours from Paris so you might want to stop before then too). The DB Bahn website is really good for trip planning – you can put in your start and finish points and it’ll tell you all the intermediate stops along the way so you can work out where to stopover. Hope you have a great trip! The train is definitely my favourite but there are some amazing road trip routes I’d like to try out too! Thank you – hope it comes in useful, narrowing down a route is always the hardest bit! I’m most impressed you thoughtfully and thoroughly reply to the thousands of us who liked your article! You’re very welcome Gordon, it’s great that the article has been so useful to so many people! There’s something so relaxing about train travel, it’s definitely worth trying, especially as places can be so close together in Europe. Hi! I am actually trying to plan a trip with my mother and sister-in-law and we love the Northern Europe route you wrote about. Would you mind sharing what site you used for your train tickets? Hi Bryanna, I generally use the Voyages SNCF site, though you can also use the train companies from the different countries – this page on the Seat 61 website has a good run down of the site for each journey: https://www.seat61.com/Europe-train-tickets.htm – have a great trip! Love your stories about Europe by Train. Thank you, it’s my favourite way to get around! Wonderful travel blog. An inspiration! I travelled recently on the Bergen to Oslo train line. It was an amazing experience and enjoyed a stunning weather and autumnal colours. I am looking to travel from Stockholm to Copenhagen next summer so more adventures to come!!! Such a beautiful route – glad you enjoyed it! Hey Lucy, Awesome post thanks for sharing such an informational post Loved it very useful as I’m planning a trip to Europe this summer. That’s great to hear – and hope you have an amazing trip! Thank you Lucy – from your Spain itinerary we flew in from Perth, Western Australia to Barcelona for 4 nights (wonderful if you keep away from tourist hotspots) then trained to Valencia for another 4 nights (train runs right by the ocean!) and then fast train to Madrid for final 4 nights. Then flew to UK for the rest of our normal catch up with the relatives. A great little itinerary. Valencia was our favorite as we hit a festival and loved the costumes, the old city, the river park and the James Bond-y modern art complex. Train travel was delightful (unlike Easyjet Madrid to London – blarggh). Thanks again. We’re planning something similar in Portugal this year. Sounds brilliant – so glad you had a great time! Train travel is such a great way to get around Europe, I’m going to have to get out there and do some more trips myself soon. I would like to visit Madrid, Salamanca, Leon and Santader. 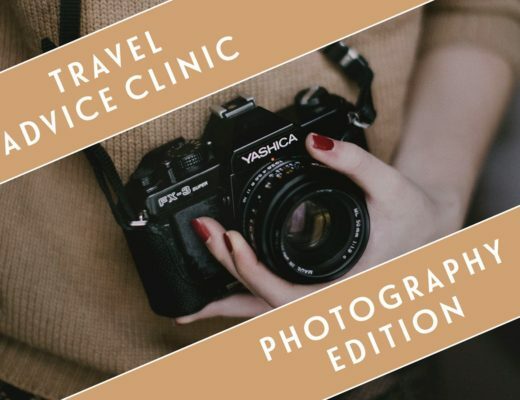 (Picos de Europa)What do you suggest? I have no idea about the distances by train. Hi Luca, the DBahn website is really good for checking out distances and times for trains – it looks like each of your destinations is only a couple of hours from each other so it should be easy to do by train. Hi Sabeel, sorry my mistake, it should read Tirano (Ticino is the region), I’ll get that updated. 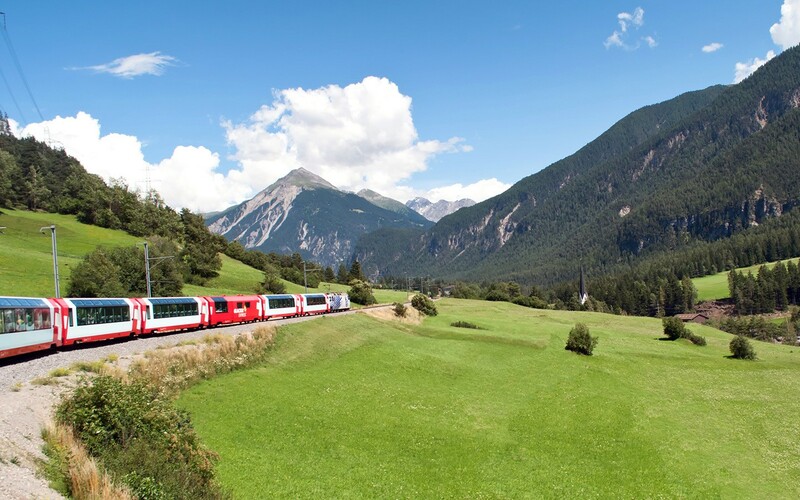 The Bernina Express is really comfortable – I travelled with my parents who are both in their late 60s and they had no problems with the journey. Hope you have a great trip! Thanks a lot for such a great information. Europe is the beautiful place to visit. I love to travel with train! But there is so many confusion in the route of Europe. This article helps a lot. Thanks – that’s great to hear! Forgive my ignorance – really interested in the Northern Europe – Canals and chocolate trip. Would like to know more especially regarding accommodation in each stop. Do we book our own or is it part of the deal? Hi this is just a suggested route so you would book your own accommodation and tickets along the way. This is a brilliant article with the suggestions that I didn’t know I needed! Thank you, Lucy. I am interested in combining three of the suggested itineraries – NORTHERN EUROPE – CANALS AND CHOCOLATE & EASTERN EUROPE – CONCERTS AND CAKE & SPAIN & PORTUGAL – PAELLA AND PORT. What would be the best way to do that? Would it be good to include some flights? Hi there, so glad you liked it! If you want to combine the three I think you might need one flight in there. Northen Europe ends in Milan and from there it’s 9 hours by train to Ljubljana where you could pick up the Eastern Europe route. Then you could fly from Budepest to Barcelona and finish off with the Spain and Portugal section. I have always wanted to travel europe by train but never got a chance. Your blog is very helpful and informative. Will definitely plan a trip soon. Thanks Barry – hope it comes in useful! Thank you – so glad it was useful, and have an amazing trip! Your blog post is so helpful,thanks so much especially the maps. It’s our second trip to Brussels and we would like to explore more Schengen states. Thinking of flying to Venice on the 11thFeb late flight out and travelling to Milan via Le Frecce train from Venice. Trying to cram many destinations,hoping that a good route plan for this can make it more efficient. We open to explore Switzerland too,if the route plan allows.Your help would be greatly appreciated. Nb: 16&17thFeb we will be in Kortrijk,Brussels. Thanks. Thanks! 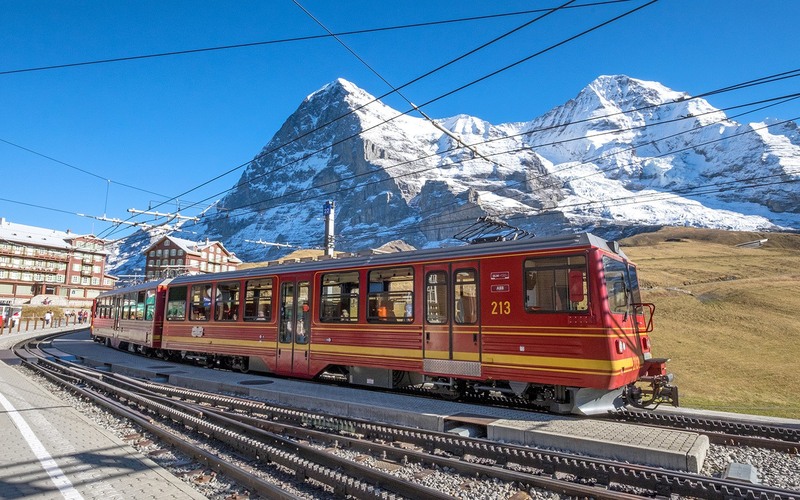 If you have a couple of days from Brussels I’d suggest the Alsace in France – Colmar and Strasbourg are both beautiful places, and then you could go on to Switzerland and maybe Interlaken which has some lovely train rides in the mountains. Love this post- so informative and inspirational. I’m a real train lover (my grandkids call me Nanny Choo-choo) so I’d love to take everyone of these trips. Did a bit of train travel in Italy in Summer and crossed US and up to Canada last May. This year I’d like to train it back from Greece where we will be staying and see as many places as possible on the way to the UK. That sounds wonderful! I love travelling by train as much as I can – Canada and Italy both in the planning for me this year. Great post! I’m looking at organising a trip with my sister and I am just wondering how did you book the trains and were they very expensive? Hi, we booked the trains through the train companies in each country – or another option is to get an InterRail/Eurail pass and then you just need reservations for some journeys – the Seat 61 site is a great resource to tell you how to book for different routes.